Chris Ducker is a British Entrepreneur, the founder, and CEO of Live2Sell Group and Virtual Staff Finder Companies in the Philippines. Chris is also the author of “Virtual Freedom.” He was suffering from this ‘Superhero Syndrome’ in 2009, but by the end of 2010 he had cured himself and in the process was building his business faster and in a more profitable manner than ever before. Chris began the process of removing himself from his company, slowly relinquishing control of different roles until he was completely free. The company continues to grow and deliver service to their customers, while Chris explores new entrepreneurial projects, including a blog where he teaches others how to become a “virtual CEO”. Chris knows how you can get the help you need with resources you can afford. Small business owners, consultants, and online entrepreneurs don’t have to go it alone when they discover the power of building teams of virtual employees to help run, support, and grow their businesses. 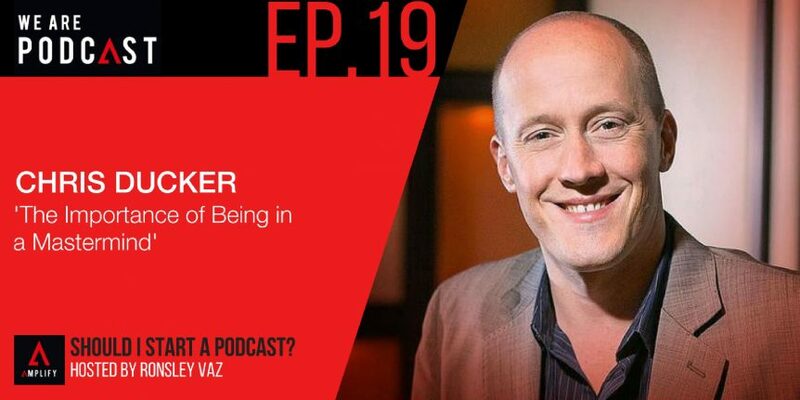 How did Chris Ducker manage his business so far and build it successfully? What his perspective or idea about fear? Why is Podcasting so hot all of a sudden? What are the key factors to have a quality podcast? What made him get into Periscope? When someone is considering a podcast as a medium, how do I know if it's for me? How complicated is it to be a podcast entrepreneur? Well, I think first and foremost, you need to try and get as original as possible in terms of your show format. In terms of the way that you are and the way that you put effort into the show, because of that right there is already a step ahead to a lot of podcasts out there. I think secondly, you do have to invest a little bit of money now and, at least, get a decent microphone. Gone of the days when you can podcast and be taking seriously by using your iPhone headset. I mean its ok on a hop now and then, but ultimately, I think you do need better equipment which can sometimes be as little as a $100. I also believe that consistency is a critical factor. A lot of people would stop podcasting even with good ideas and good quality audio, but they will disappear after a period of time. And then they'll just appear for a month, to do a show. I think consistency is key. “I don't subscribe to any podcasts but I'm an ad-hoc listener. I follow shows but don't actually subscribe to any of them. So on my list right now, I've got Jay Today with Jay which is unfortunately done. I love that little short form video podcast. I've got Smart Passive Income. I've got James Schramko Super-fast Business. I have an employable by Brian Clark and I also have New Rain Maker by Brian Clark.